Dolores Huerta has dedicated her life to fighting for the civil and human rights of those who are oppressed or disenfranchised. Along with Cesar Chavez, Dolores Huerta co-founded the United Farm Workers and helped organize the delano grape strike in 1965. 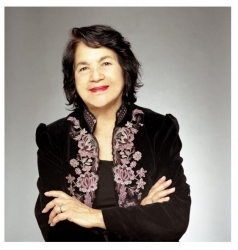 She is also credited with coining the phrase “Sí, se puede.” Dolores Huerta Elementary School will be the second K-12 SFUSD school named after a Latino/a person (the other is Cesar Chavez Elementary School). “Our school is where we want to teach students the power of voice, the power of presence, the power of being, the power of standing up for dignity and fighting for equity, embodying the life lessons and activism of someone like Dolores Huerta. By adopting the name of a strong Latina leader, we also would like to send a message of empowerment to all our female students, particularly our female students of color,” Fairmount Elementary Principal Luis Rodriguez said. Founded circa 1864, Fairmount Elementary School has educated generations of San Francisco children and, by many accounts, established the first Parent Teacher Association in the state of California. The school has a long history of providing excellent academic opportunities through its schoolwide Spanish Dual Immersion Program, beginning with 80% of instruction in Spanish in kindergarten and decreasing to 50% by 5th grade. Fairmount serves around 400 students in pre-kindergarten through 5th grade, including English learners, bilingual students, and English proficient students.